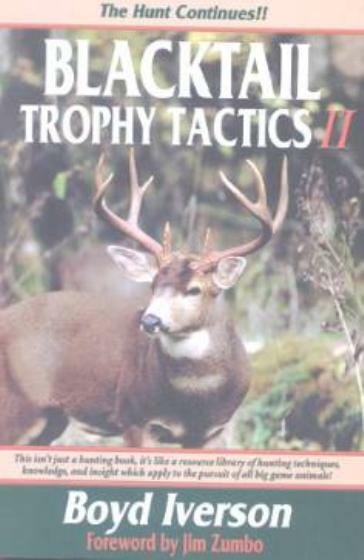 In a greatly expanded and updated follow-up to Boyd Iverson's highly successful first book Blacktail Trophy Tactics, the author proves that this big, new book is indeed the textbook on trophy blacktail hunting. It is the culmination of two years of work in reanalyzing, reworking and adding to the first book to provide the latest, best information on hunting trophy blacktail bucks. Chapter have been revised and several chapters contain all-new information, and there are lots of color photographs. As Iverson says on the cover, “This isn't just a hunting book, it's like a resource of hunting techniques, knowledge and insight which apply to the pursuit of all big game animals.” Issued in 6x9-inch format, this big 310-page book is chock-full of information, advice in 20 chapters including such topics as scouting for success, scents and nonsense, of guns, bow and optics, the ripple principle, winds of change, moon madness, and gizmos, gadgets and paraphernalia . With a Foreword by Jim Zumbo.